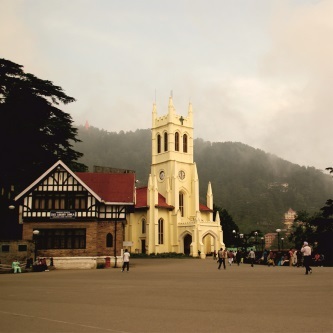 Positioned below the towering Jakhoo hill on The Ridge, watching the extensive assortment of snow-capped Himalayan range, is the iconic Christ Church, which since its inception in 1857, has been the nerve-centre of Shimla town. Built of stone and brick in a lime mortar by Col. J.T. Boileau with neo-Gothic elements, the cornerstone of the Church was laid on 9 September 1844 and was consecrated on 10 January 1857 by Bishop Wilson of Calcutta. It was only after three years since the spire of Christ Church was erected that the stained glass windows over the altar and the clock on the façade were placed in 1860. Heavy snowfall in 1961 caused extensive damage to the building. The structure was repaired and over time has undergone renovations. Yet, the overall structure retains its essence and has a nave, chancel, and tower. The floor has a centre aisle and two side aisles flanked by pews. Today, Christ Church, whose silhouette is visible from miles around the vicinity of Shimla town, tells the story of the town’s rich history and stands as an embodiment of enduring legacy of the British Raj. It is one building in Shimla that every visitor wants to capture in his lens as a memory of their Shimla visit. Built by the Catholic community of Shimla in 1886, the site of St. Michael’s Cathedral, just below the Deputy Commissioner office on the Mall Road, was selected by Lord Ripon (1880-1884), the then viceroy. With a touch of the French-Gothic architecture style, the church’s exterior is of dressed grey stone while the floor plan follows a cruciform. The church can seat 400 persons and the interior was designed with a nave and two aisles, a vestry, a baptistery and a confessional. The organ placed in the church was built in 1913 and was considered to be one of the finest in north India. Over the high altar is a recently restored tapestry of glass that depicts a group of the crucifixion, while a statue of Our Lady of Guadalupe, presented by the people of Mexico has also been installed in the church. This small wooden church rests in the heart of Himachal’s apple growing country at Kotgarh, in Shimla hills. A school was established here in 1843 and the church built in 1872. Run by the Moravian missionaries and the Church Missionary Society, St. Mary’s Church is now one of the most fascinating attraction of this countryside. At the start of the Sadar Bazaar, near the Post Office, in a pine forest is the Baptist Church of Kasauli. This petit structure was built in the 1920s and is now regulated by the Church of North India (CNI), diocese of Amritsar. The Church’s distinct architecture includes a cruciform floor, beautiful stained glass windows, three pews separated by two aisles leading to the altar with Christ comforted by Joseph and Mary sculpted on the stained glass. The Church has a large courtyard in the front and a cemetery alongside with graves dating back to almost 150 years. 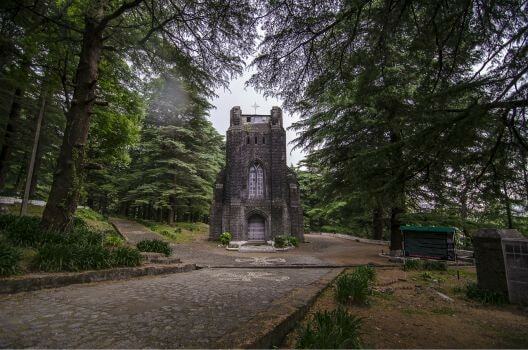 On the road from Forsyth Ganj to Mcleodganj, 8 Km from Dharamshala, the Church of St. John in the Wilderness, built in dark dressed-stone, lies in a sheltered grove of high cedars. The church suffered immense damage in the devastating Kangra earthquake of 1905. The edifice that survived reveals what an imposing and impressive building it must have been. The church still retains some of the beautiful Belgian stained-glass windows. Within the compound, is an old graveyard with an obelisk erected in memory of the Viceroy, Lord Elgin (1862 – 1863) by his wife Mary. The St. John in the Wilderness Church in Palampur town is famous for its attractive countryside. Along the tea gardens, this Church is located in a very unusual setting that is surrounded by a clutch of warm weather poinsettias and shaded by tall Himalayan cedars. This small church was rebuilt in the 1920s after it collapsed in the earthquake of 1905. The Palampur cemetery is a part of the churchyard. On Military Hospital road stands St. Patrick’s Church, largest of all the churches in Dalhousie. Built in the year 1909, the dressed-stone building is in good condition. The church is at a walking distance from Gandhi Chowk. It was made to hold a service for a congregation of a maximum of 300 people. The Church is managed and maintained by the Catholic Diocese of Jalandhar. The oldest church of Dalhousie, the St. John’s Church, a Protestant church, was built in 1863. It has a chapel with nice paintings of St. Peter and St. John. The church possesses a library with a good collection of books about Dalhousie. At a walking distance from Gandhi Chowk, the church is part of the towns colonial heritage. Prior to 1863, a wooden structure stood at this place, the idea to build a stone structure took birth with the arrival of Rev. John H. Pratt in Dalhousie Inspiring the Christian community to build a permanent church, this building was built as a smaller replica of the Roman Catholic Church of England. The St. Francis Church, a Catholic Church built in the year 1894, was made from public contributions, and that from army and civil officers. The church has some good stonework and the coloured Belgium glass facade is very beautiful. The church is at a walking distance from Subhash Chowk. This church is managed and maintained by the Catholic Diocese of Jalandhar. St. Andrew’s Church commonly known as the Church of Scotland was built in the year 1903 at Ballon by Protestant Christians. The Church is approximately one and a half km from Dalhousie bus stand. Inside a brick boundary wall the building stands protected.